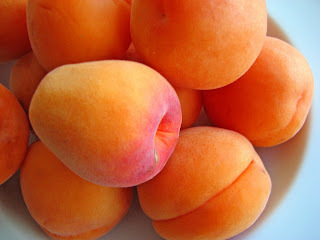 Continuing my love affair with the season's amazing apricot bounty, today’s reverie is all about the fruit. 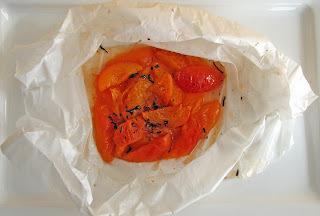 We have gorgeous apricots baked in parchment paper, en papillote. How simple and elegant is that? If you love apricots in a fairly unadulterated state, you will surely have to try these. Thanks to Pierre Hermé, we have a wonderfully fresh aromatic dessert that is incredibly easy to produce in just a very few minutes. These sumptuous tart-sweet apricots with just a hint of spice come together in a miraculous flush of flavor after ten minutes in the oven. The combination of sugar, the lavender and bergamot emanating from Earl Grey tea, and the lemon zest and juice add a sublime aroma. A very small dab of butter lends a silkiness to the whole mixture. The subtle soft flavors blend miraculously and the juices are out of this world, almost too good to be true. Sometimes it’s best to just let nature shine, pure and simple. Try this. - Putting together these packets needn't be a matter of precision. Use your own taste and judgment when distributing the seasonings. I give you my preferences, but use a bit more or less in your own proportion, according to your own whim. 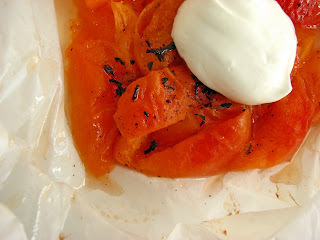 - I used parchment paper and employed some tartlet pans to hold down the two sides of the packet to ensure a tight seal. - You can choose to garnish or not. I much prefer the fruit as is without any cream. But if you wish, Hermé recommends ricotta sweetened with sugar, honey and orange flower water. 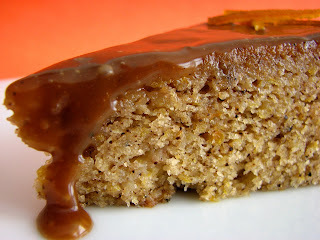 - This is a dessert you’ll want to enjoy warm, so serve immediately. - Save the apricot pits for Noyau Ice Cream, coming soon! Prepare four pieces of parchment or foil about 12” x 14”. Halve the apricots and remove the pit. Slice each apricot half into 3 pieces. Place sugar, about a teaspoon of Earl Grey tea, the zest of one half lemon and a few grinds of fresh pepper in a food processor or a clean spice grinder. Process until the aromas are released and the mixture is blended. 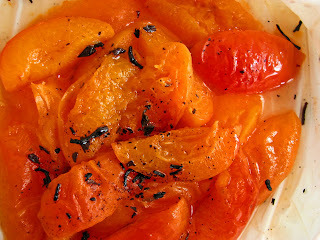 Place about 24 slices of apricot onto a piece of parchment or foil. 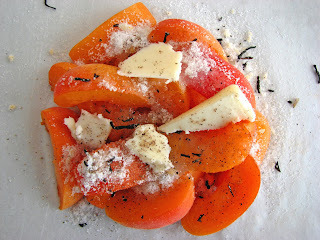 Sprinkle the sugar spice mixture evenly over the apricots. Add a spritz of lemon juice. Dot with a bit of butter. Bring the parchment paper together and fold the packet down the middle until it lies flat. Fold up the remaining two sides tightly. You want the packet to be tightly sealed so that no steam escapes. Place the packets on a baking sheet. Bake for 10 – 12 minutes or until the packets are puffed. Place each packet on a dessert plate and serve immediately. Take in that wonderful aroma and magnificent flavor. (If you click on these photos, I do believe you'll be able to swim in this sensation...) Ahhhhh, apricots. If you’re anything like me, you have some favorite seasonal fruit pastries that you absolutely must make every year. They are at the top of your list. You anticipate the season’s fruit arrival for weeks and weeks and you stalk the markets for the first sign. The spring and summer fruit season does that to me. So many gorgeous things in our pastry toolbox. Imagine my sheer bliss at the sight of this season’s apricots! They are just about my favorite pastry fruit and every year I wait in total anticipation of a first sighting of their bright pastel glow. Perhaps it was growing up down the street from an apricot orchard that first got me hooked. These fabulous earthly gems just make my heart sing. My only sadness is that the season is so unbelievably, achingly, unrealistically short. In just a matter of days, they will be gone. So please, put down what you’re doing and run, do not walk, to the nearest apricot display. There is not a moment to waste. One of the apricot pastries I must always make is an apricot galette. It’s one of my favorite things in the pastry kingdom. Then there’s today’s apricot compote, which comes from the pages of In the Sweet Kitchen by Regan Daley. She, too, is an apricot aficionado. She, too, understands apricot adoration. And she does not fail us. With the minimalist brilliance of a bit of honey, vanilla bean and cinnamon – the holy trinity of complimentary flavors for our beloved apricot – she has managed to take us to a new frontier of apricot worship. And worship I will because this is one of my must-haves every apricot season and yes, here we are. I’ve paired the compote with a light cornmeal cake because its golden tenderness and slightly sweet crunchiness seem the perfect complement for our sumptuous apricots. It’s one of those enduring partnerships that fill your dreams until the season arrives at last. 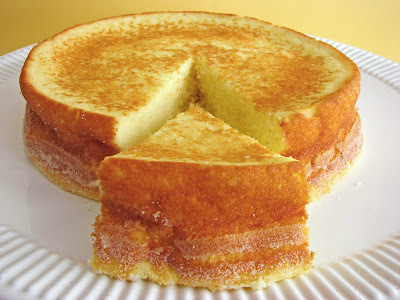 I’ve tried and tested a lot of cornmeal cake recipes. It can be hard to get the right balance of cornmeal and the right level of density or tenderness depending on the dessert you’re aiming to create. I love the Cornmeal Peach Upside Down Cakes of last summer, but this one is different. It’s a bit sturdier to stand up to the sweet tart acidity of the fruit and the spicy brightness of the syrup. Perhaps you also have a favorite or two? Do give this one a try if you have a chance. I'll bet you won’t be able to stop sampling this dessert once you’ve been enveloped in all of these incredible aromas wafting through your kitchen. 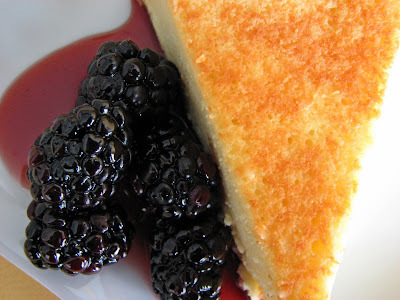 The tart sweet spicy smooth flavors of the compote and syrup and the lovely buttery cornmeal cake with the delicate flavor really truly are a very happy marriage. Let’s get going. There is apricot ice cream and sorbet to churn, apricot galettes to fashion, apricot soufflés to whip. So many apricot desserts, so little time. The hour is here! - I use a stand mixer but I always take the mix off just before it’s done and finish it by hand to avoid over mixing. - When making the compote, be sure not to let the mixture boil. Keep it at a low simmer to preserve the flavor of the fruit. You want a lovely, soft compote, but not jam. The compote can be made a day ahead. Store the apricots and the syrup separately in your refrigerator. - Save the pits from the apricots for Noyau Ice Cream! - If you’d like to garnish this dessert, try a sweetened crème fraiche or a cream whipped with the syrup and some of the apricot folded in. 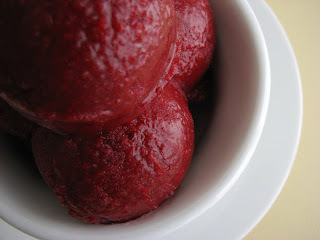 - This compote would also be good over vanilla or honey ice cream. - You will have extra syrup from this compote. You know what to do. 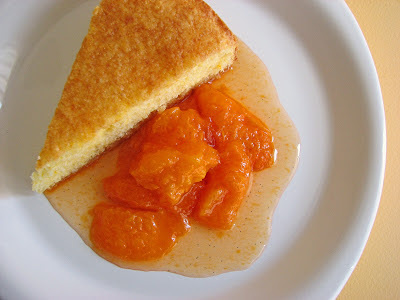 - This cornmeal cake would also be good with a compote of peaches and/or berries. Or cherries. Or figs. Or date compote. Preheat the oven to 350 degrees. 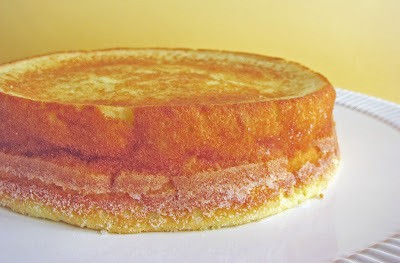 Prepare a 9” cake pan with butter and dust it with cornmeal. Sift the cake flour, cornmeal, baking powder and the salt. Beat butter until smooth. Add sugar and beat until light and creamy. This will take a few minutes. Scrape down the bowl after a minute or so. Add eggs one at a time. Add vanilla and citrus zest. Add the sifted dry ingredients in thirds, alternating with half the sour cream, beginning and ending with the dry ingredients. Scrape down bowl halfway through this process. Just before it looks completely mixed, pull it off the mixer and finish combining by hand to avoid over mixing. Pour into prepared pan and smooth over the top. Bake for about 30 minutes or until it tests done. Cool for about 15 minutes. Turn out onto platter and let cool completely. Halve the apricots and place in a saucepan with the remaining ingredients. Bring to a low simmer. Do not boil. Poach until the fruit is very soft but still fairly intact. Remove the fruit from the syrup and set aside to cool. Bring the syrup to a slow boil and reduce until it is a medium thick syrup. Cool. 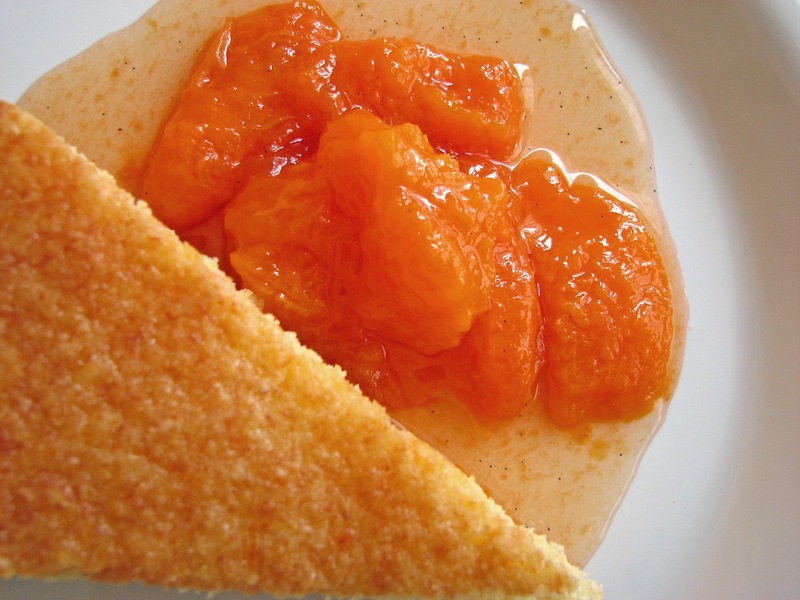 Serve a slice of the cake with a good helping of the apricot compote and syrup. 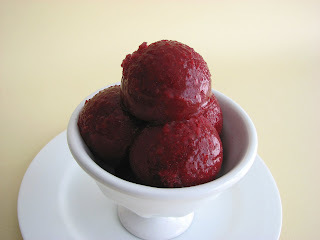 In the midst of a heat wave, what can I do but make sorbet? Much too hot to fire up the oven, that's for sure. And with fresh raspberries making a welcome appearance in so many markets this week, it’s time to enjoy their lusciousness without making too much fuss. 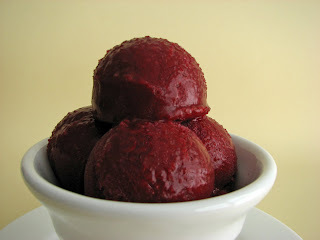 I decided to make a cool and quenching Raspberry Sorbet and dress it up a bit with the sophistication of a great red wine. David Lebovitz shares his recipe for just this thing in Room for Dessert and it’s really delicious. It’s a simple sorbet that really showcases the tartness of fresh raspberries and the depth of a good fruity wine all in one lovely dish. A cup of sugar lends just the right level of sweetness that does not overwhelm the clean bright burst of fruit. It’s a terrific way to enjoy a super light dessert that will definitely bring on a bit of cool in this very lovely moment of Spring. Just the sheer beauty of its rich color is enough to stop you right in your tracks. Exquisite. - Be sure to use a very fruity wine to enhance the flavor of the raspberries. 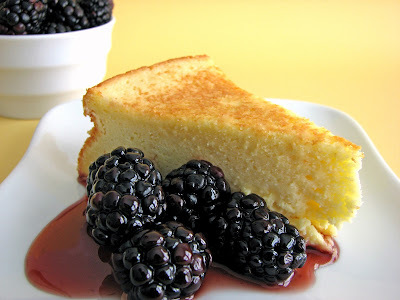 - If your berries are extremely tart, you may want to increase the sugar by a tablespoon or so. - There is also a recipe for a Sangria Sorbet recipe in this book. Similar idea but it uses orange or tangerine juice instead of raspberries. We’ll have to try that one sometime soon. Place sugar, water and wine in a saucepan and bring to a boil. Continue to boil for 1 minute. Remove from heat and add the raspberries. Cover and steep for at least 1 hour. Using a rubber spatula, push the mixture through a fine sieve into a container. Chill thoroughly. One of my greatest pleasures is slowly mulling through my cookbooks and all those stacks of recipes rescued from magazines and newspapers of another time, finding inspiration again and again. Even greater is discovering a previously unknown and absolutely fabulous recipe in my midst. Today's incredible treasure is this Goat Cheese Cake from Emily Luchetti. Have you ever wanted to eat a piece of cheesecake without feeling like you’ve just eaten a piece of cheesecake? This is your dessert. The recipe calls for goat cheese without the usual addition of cream cheese, so it's quite a different experience. Because goat cheese has a lower fat content and is a pure product without any gums or emulsifiers, it brings an incredible lightness to this beautiful dessert. That lightness is also emphasized by the addition of whipped egg whites gently folded into the batter. The slight tang is balanced by the sugar and rounded out by a bit of lemon juice and zest and the lovely perfume of vanilla. The cake tastes bright, fresh and absolutely delectable. 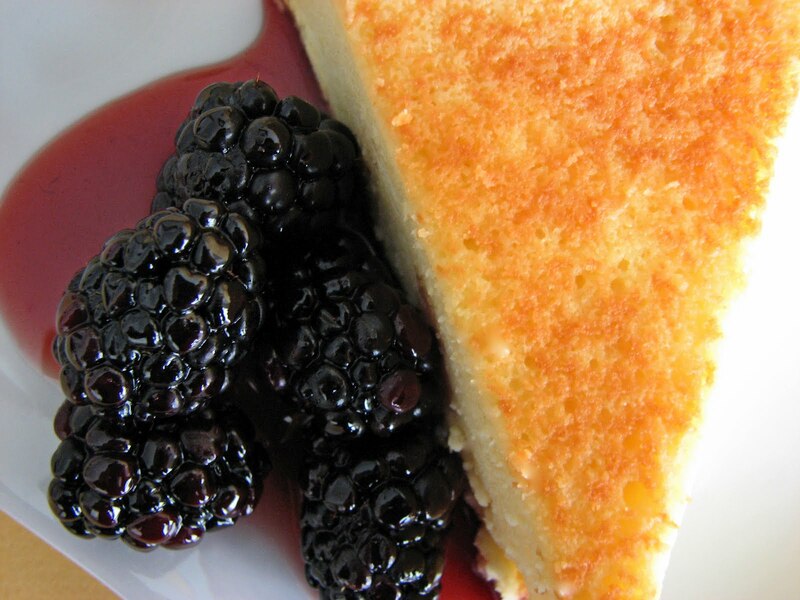 The texture is bolstered by 3 tablespoons of flour that give it just enough body to allow a wonderful comparison to a New York Cheesecake, yet there is no fatty taste or heaviness left behind. I could go on and on. Are you with me? The preparation is easy and quick and it’s ready in under an hour. Try this for your next dinner party or celebration and you will be amazed by the results. Thank you, Emily Luchetti! - Bring the goat cheese or chévre to room temperature to ensure an easy and complete combining of ingredients. Eggs must also be at room temp. - I served this with blackberries that I sprinkled with sugar, a bit of Crème de Cassis and an equal splash of lemon juice to taste. Really delicious. - This cake will keep for a few days, but the texture changes dramatically. When eaten fresh, it has a very light and airy texture. After refrigeration, it becomes more dense. - I used an 8" cake pan because I wanted more height for presentation. It baked in 25 minutes in my hot oven. Preheat the oven to 350 degrees. Prepare a 9-inch round cake pan with butter and dust it thoroughly with granulated sugar. Tap out the excess. Mix the goat cheese, sugar, vanilla, lemon zest, and lemon juice with the paddle attachment and beat until smooth. Add the egg yolks two at a time, beating well after each addition. Add in the flour and mix until incorporated. Place the egg whites in a clean bowl and whip to soft peak. Gently fold the egg whites into the goat cheese mixture with a spatula. Be careful not to overmix or you will deflate the batter. Pour into the prepared pan. Bake 25 to 30 minutes or until a skewer inserted comes out clean. Let cool to room temperature. Toss the berries with sugar and lemon juice (and Crème de Cassis, if using), to taste. Run a thin knife around the edge of the pan to loosen the cake and turn out onto a platter. Go ahead and swoon. I absolutely love citrus fruits. In pastries or desserts, a bit of citrus is always a vital element even when it is not the star. Citrus will always perk up flavor but when it’s the central ingredient, it’s nearly irresistible. Looking to put a large juicy orange to good use, I recalled a cake that someone made for me a couple of years ago. 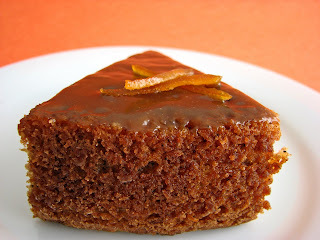 It was a very orangey spicy cake with a tender texture I can still remember. It came from a cookbook by David Lebovitz and was gifted to me by someone who had done some recipe testing for him. So as I was contemplating that orange sitting on my table, I flashed on that cake and decided this is how I would fashion it. 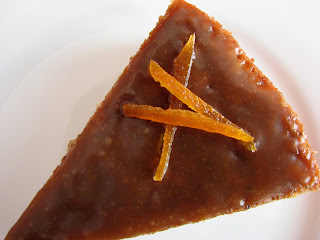 The cake is bursting with the essence of orange flavor and infused with the complexity of allspice. It incorporates a whole orange that has been simmered to remove any bitterness of the pith. It’s not complicated in any way, but requires a little bit of preparation before you set about to mix the cake together. 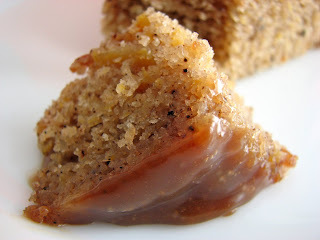 The glaze is easy and adds a nice note of buttery caramel that really dresses it up. 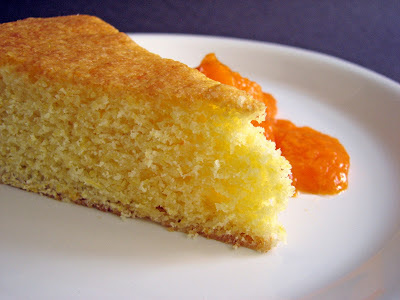 If you love orange flavored pastries, you will certainly love this cake. - I happened to have one lemon half that had been used for its zest, so I decided to throw that into the simmering water along with the orange and I’m very glad I did. It enhanced the flavor perfectly. The resulting fruit mixture came to 1 C.
- Taste the glaze as you go and add salt until you have the right balance. I love salty caramel, so I went with a few grains more. - I couldn’t put my hands on some currants easily enough when the mood struck me to make this cake, so I omitted them. Cut the orange in half and place in a saucepan with the salt and enough water to cover (add the lemon half too, if you’re using). Bring to a boil. Reduce the heat, cover and continue to cook on a low simmer for about 1 to 1 1/2 hours or until the fruit is limp and easily pierced with a knife. Drain and finely chop in a food processor. Do not puree. The resulting mixture should come to 1 C. Set aside. Preheat your oven to 350 degrees. Prepare a 9” x 2” cake pan. Sift together the flour, salt, baking powder, baking soda and allspice. Beat the butter and granulated sugar for approximately 3 minutes or until smooth and creamy. Add the eggs one at a time. Add vanilla and mix until the ingredients are fully incorporated. Add half the dry ingredients and mix for a few seconds. Add the milk, chopped orange and currants and blend. Add the remaining flour mixture and just as it starts to come together, pull it off the mixer and finish it by hand to prevent over mixing. Pour the cake batter into the prepared pan and bake for 45 – 50 minutes or until it tests done. Cool for at least 10 minutes before turning out. To prepare the glaze, melt the butter in a saucepan and add the sugar. Cook without stirring for 2 minutes. Then, stirring constantly, add the cream and salt and continue cooking and for another 2 minutes. Remove from heat and add the vanilla. Cool for just a few minutes to lukewarm. Pour quickly over the center of the cake. Use a small metal spatula or a butter knife to spread the glaze if necessary. Serve with your favorite spot of tea.